The Young Yellow Wollywog (Young Yellow Wollyhop in the European version, コイモガエル?, lit. 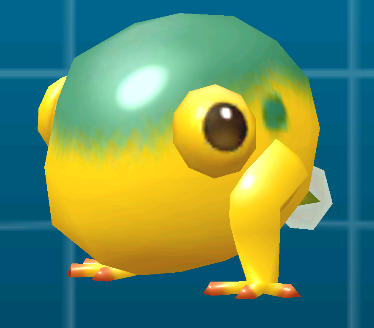 : "Young Potato Frog") is an enemy found in Hey! Pikmin. It is the transitional form between a Wogpole and a Yellow Wollywog. It is mostly yellow but has a green head and two green spots on its sides. Similar to the Yellow Wollywog, it has large black eyes that protrude outward slightly. It has a tail similar to the Wogpole, although it is yellow, rather than blue. It is slightly wider than Captain Olimar, and about two thirds his height. When on land, it moves and attacks by hopping forward in the same direction, crushing any Pikmin that it lands on. When it's in the water, it will swim back and forth. Young Yellow Wollywogs are capable of traversing both water and land. They hop/swim back and forth, but do not actively try to attack Pikmin. Young Yellow Wollywogs can be defeated with a single Pikmin throw. A Young Yellow Wollywog preparing to jump. A Young Yellow Wollywog jumping. A dead Young Yellow Wollywog. This page was last edited on March 4, 2019, at 11:53.